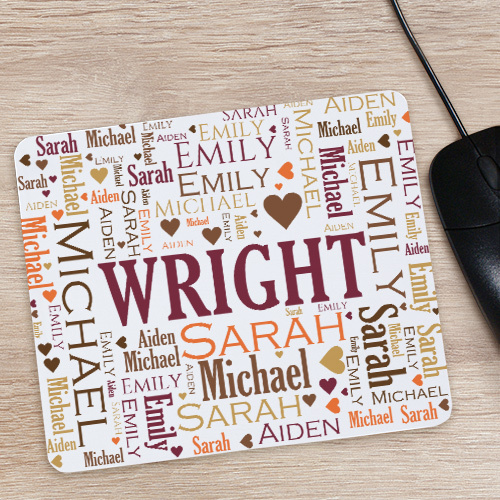 Display your love for your family with our Personalized Word Art Family Mouse Pad. We'll custom personalize this word cloud art with any family name along with any name(s) of your choice for a personal touch to call your own. Available in a variety of color options! Teachers loved them. I only wish there was more artwork (pics) to choose from. Exceeded my expectations. I loved it!! !😍 Thnx giftsforyounow. Excellent Gift - Great Quality at a Great Price - I will be ordering more! Additional Details Thinking of other gifts for the office or other home decor? Check out a personalized house warming gift from GiftsForYouNow!